An exclusive gated resort, Beach Colony is located on 11 acres of fabulous beachfront with 300 SF circular balconies, 2 elevators, 4 units per floor with semi-private entrance. With 1750 SF of living space, this 12th floor unit is exceptional in every way. For those who expect only the best, Beach Colony Tower 12D is included in our collection of outstanding luxury vacation properties and is guaranteed to please the most discerning guest. We completely renovated and professionally decorated our unit in January, 2016. It features wood-look tile throughout with bead board wainscoting and plantation shutters for a real beach cottage feel. All beds have new memory foam gel mattresses. Kitchen has granite countertops,custom backsplash. and is fully-stocked.. The dining area is unique with seating for 8 at our custom built fold-top table and seating for 3 at breakfast bar. Our spacious living room has all new furnishings including custom sectional with pull out queen bed, 55 inch Smart LED TV with enhanced cable package, SEC network and DVD. The large master bedroom has a King size bed, designer bedding, 46 inch LED TV, walk-in closet and gorgeous gulf front views with sliding doors opening to large balcony. Guest bedroom number one features 2 full beds, 32 inch flat screen TV and Smart Blue-ray DVD player. It has direct access to the full hall bath. Bedroom number 3 features a queen bed, 32 in LED Smart TV, and private bath with walk in shower. All baths have been updated with raised vanities, granite, new fixtures, custom shower tile and glass enclosures. The master bath has his and her vanities, jacuzzi tub with corner picture windows and views of the beach and large, walk-in shower. The staff was friendly and efficient . They understood that we were tired from a long night of travel and got us in our room as quickly as possible. Tower 12D is a spacious and beautiful condo. This is the second time weve stayed at this condo and it most likely wont be our last. Truly an exceptional vacation experience. Beautifully decorated condo! Very comfortable! We will be back next year. We enjoyed family time on the beach and relaxing on the beautiful balcony. 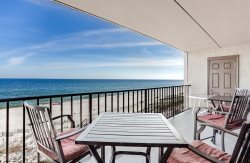 We stay at Perdido Key every year and this condo is our favorite! The condo was beautiful and comfortable! Your condo is one of the nicest we have stayed in. The kitchen had everything we needed and it is decorated so beautifully The furnishings and bedding was wonderful as well. We really enjoyed our stay! We had so many memorable moments, and lots of laughs playing cards and dice. Thanks for providing those!